Ethylene Gas – Fruits and vegetables give off ethylene gas which speeds up the ripening process and causes over-ripening and produce to go bad. Our dinners have been really simple lately and involve lots of grilling -I love summertime grilling since it gets us out of the hot kitchen. Remove from the grill and allow to cool slightly. Chop all of the vegetables to the desired size. Combine the grilled vegetables, corn, sun-dried tomatoes and cooked quinoa in a serving bowl. I love this grilled veggie salad, Kelly! What a great idea! I always buy too many veggies in the summer too, so this is just perfect. And I’m loving the quinoa in here. So pretty! I’m loving all of the fresh produce that is available this time of year. I hate wasting food, too, and those foodsaver boxes look really cool! This quinoa salad looks delicious! I love how packed with veggies it is! I have similar tendencies to go crazy with the fruits and veggies! This is the perfect solution. Thanks! Thanks Erin! 🙂 Hope you’re having a great weekend so far! Anything that makes my produce last longer is a good idea to me. This is such a gorgeous colorful salad!! Thanks Sues! 🙂 Happy weekend! I love a good grilled veggie salad, but add quinoa in there and I’m totally obsessed! This looks absolutely perfect!! Thanks Chelsea! 🙂 Hope you’re having a great weekend so far! Those produce savers really do work wonders! I still have some leftover peppers and it’s been nearly three weeks now and they are still so fresh and crunchy! Thanks Eva! Hope you’re having a great weekend so far! I do the same thing with produce, Kelly. Especially when I go to the farmer’s market. This salad looks like a great way to use all those fresh fruits and veggies. Love the quinoa! Pinned! Haha glad to hear I’m not the only one 🙂 Thanks Rachelle and for pinning! Happy weekend! Aaw thanks Annie! Yum! Farro sounds fantastic too – I have to try that next time! Thanks for pinning! Hope you’re enjoying the weekend so far! Such a gorgeous dish for Spring! Pinned! Kelly, What an amazing and vibrant looking looking salad bowl. These grilled veggies looks so divine, and addition of quinoa is astounding! This looks so refreshing and light! I love the combination of vegetables you used to make this standout dish! Thanks Hayley 🙂 Hope you’re having a great weekend so far! This is not only delicious, also so good for you! Next time I make quinoa, roasted veggies will be a must. That looks absolutely amazing! I love all the veggies in it. I’m exactly the same way in the summer, buying every fruit and veggie in the store because they all look so good now that summer is finally here! Thanks Stacey! So glad I’m not the only one, summer produce is so good 🙂 Especially after that long winter we had! Grilled veggies. Check. Quinoa. Check. Perfect salad – oh yes! 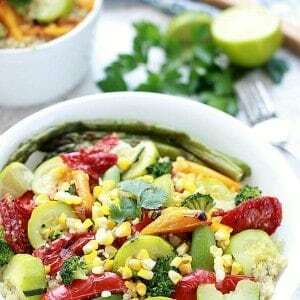 Kelly, I LOVE grilled vegetables. . and mixed in this quinoa salad, I bet this is amazing!!!! I must try OXO’s new line of GreenSaver boxes! I need those!!!! Kelly, you know how much I love quinoa! This salad looks awesome! I need to try these OXO boxes 🙂 Pinning! Haha you are the quinoa queen – love all your quinoa dishes 🙂 Thanks Mira and for pinning! Hope you’re having a wonderful weekend so far! This salad looks very healthy! And delicious too! This is the perfect salad, Kelly! 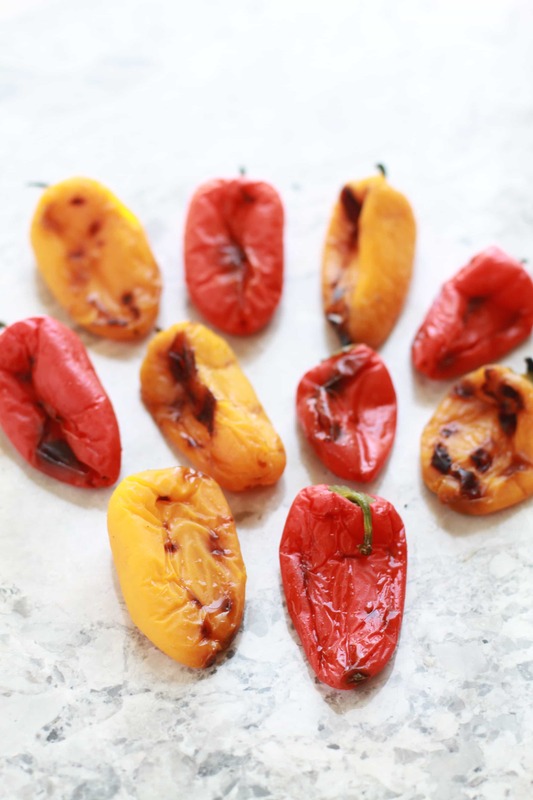 It has all of my favourite veggies – and I really love the taste of them when they’re roasted! Quinoa makes the perfect addition too. I can’t wait to try this delicious creation! Thanks Harriet! Hope you enjoy! We are firing up the grill lately and I think we’ll be grilling up a bunch of veggies today. I can relate to buying too much though I’ve been trying to think about it a little more and buying less/shopping a little more frequently instead. It’s not easy but since I have the luxury of grocery shopping alone (no child with me 🙂 , it’s almost fun. This is a lovely well-balanced salad. haha I definitely go overboard too during the summer months with produce! I love everything you have packed in this salad – so my kind of meal! Have a great weekend friend!! Oh yum!! This looks so amazing!! I seriously LOVE grilled veggies and always get them when I go to Whole Foods! I must make them!! I need one of those storage containers! I hate having to buy something right before I use it because it won’t store for very long. And this looks perfect for summer! Thanks Amber! The storage containers are awesome! I still have some of those peppers leftover – it’s been almost three weeks now and they’re still so fresh and crunchy. I love anything with grilled vegetables! This sounds so perfect :). And such a great recipe for spring and summer! Grilling out is so much fun when the weather is nice. This sounds wonerful! I love that it has grilled veggies! Yum! What a beautiful and hearty salad! This is perfect too because I have a ton of summer squash growing in my garden right now. I’m going to be making this ASAP as it looks so deliciously summery and vibrant (the closest I will get to summer in London…)! This big bowl of fresh and vibrant grilled veggies is just making me so happy!! I’m sure it tastes even better than it looks! I want those containers…I over-buy veggies too at the farmer’s market. This is a great salad for any day! I totally need some of those storage containers! I tend to overbuy produce this time of year too and I hate when it goes bad. Love the beautiful colors in this quinoa salad. It looks so healthy! Not a big fan of quinoa but this recipe sounds good! I am SUCH a big fan of all your recipes and get so excited by your veggie-filled vegetarian ones 🙂 This grilled vegetable salad looks right up my alley, Kelly! It honestly has all my favorite flavors in it. Quinoa + grilled veggies??! Yes please! Pinning!!! This salad looks amazing Kelly!! Such a gorgeous salad that has an abundance of delicious veggies. So making this, this weekend. Perfect for my ongoing “diet”, hehe. Pinned!! This grilled veggie quinoa is so beautiful, and absolutely perfect for this time of year! I’m like you, I buy too much produce at one time… I just can’t help myself, everything is so vibrant and beautiful! Plus I swear I can literally hear it begging to be placed in my cart 🙂 This is a great way to utilize all that deliciousness! Love.It! Pinned! Kelly – I don’t even have the excuse of 2 little munchkins, but, sometimes I end up buying way too much produce too – and there’s only 2 of us at home – we can only eat so much – so I gotta get my hands on some of those GreenSaver boxes! By the way, this is one gorgeously colorful and flavorful salad. Thanks so much Shashi! It’s so hard not to overbuy when the produce is so good right now 🙂 Have a great rest of the weekend! We love grilling veggies! Your salad looks both nutritious and delicious, Kelly! Thanks Julie 🙂 Hope you’re having a great weekend so far!